I seen a post a while back about a guy that was wondering if Traxxas was going to discontinue the Emaxx. At the time I thought; why would Traxxas do that? I figured at worst Traxxas would update it like they did the ERevo. The other day for grins, I was looking at all the different models Traxxas had in their "Support By Model" webpage, and noticed that they didn't have my beloved Emaxx. Thank God that I'm ex-Recon, because I would of cried my eyes out. I'll bet you that with the Xmaxx and the new revamped ERevo that Traxxas will do away with the Emaxx. It's to early for anyone to say for sure. If true, however, that would break a lot of people's hearts...mine included. The Emaxx is a great truck, a blast to play with, and a lot of fun to modify. Please Traxxas have a heart, and don't dump the Emaxx. Last edited by cooleocool; 02-09-2019 at 09:45 AM. Reason: Bypassing the language filter. The ReglarGuy is kid tested and father approved. An I hope they don’t do away with it!! The emaxx was one of the most fun trucks I’ve ever had and driven!! Didn’t need a ton of upgrades to be one heck of a great truck!! Traxxas if you are thinking about getting rid of the tried and true emaxx, PLEASE DON’T!!! I'm in the same boat, sad but true Traxxas has discontinued the Emaxx as per a call to Traxxas directly last August. Maybe if hundreds of billions of people post a reply here saying how awesome the Emaxx is, maybe, just maybe Traxxas will change their minds. Haha maybe if they did a limited run of whatever they feel is necessary to gauge the interest of the public and they had a fast sell, that might warrant them to continue production. But as much as we love the 2 we have I think Traxxas has moved on, that's JMHO. Yeah, sadly RC’s aren’t like 1:1’s. An ancient platform doesn’t mean collectible/cool, it just means worthless and underperforming. Very few exceptions are made here, like the tamiya avante, so I hope the emaxx becomes a classic. But to be honest, I don’t think that’s the case. The T is definitely a classic and being made still because of that, but the E really isn’t a classic, just old. I would imagine that Traxxas would rather push the newer trucks, because if demand for newer, better technology increases, the price increases. So if they're doing it for that reason, it's actually kind of smart. The E-maxx was my first ever hobby grade RC truck. For some time it was an awesome truck, but after a long break from the hobby, and the emaxx just sitting still on a shelf for many years, I returned to find that the E-maxx was just too weak. Still running the brushed Titan 550s, I couldn't keep the plastic parts in one piece. All of the weak points were too much for me, so I wasn't sad to see the Emaxx go after getting my Rustler and seeing how well that performed with a single motor and 2wd. That was the last excuse I needed, sold the Emaxx. Shortly after, Dad sold his Emaxx and got a P2de and that has been the kind of RCs we drive now. So it would seem to me that if the Emaxx doesn't perform as well as a brushed 1/10th 2wd, then it may actually be outdated. That's just my take. This is completely understandable...however, this was not an entirely great move on Traxxas' part. Yes, the Emaxx/ Tmaxx had a weak drivetrain out of the box. Even the bulkhead design was weak. However, this was the truck that put RC Monster trucks on the map. Traxxas did a few updates over the many years, but none that really made a huge difference in reliability. I really think Traxxas could have kept the outboard shock design, went with longer travel and larger bore single shocks per corner. Then redesigned the chassis, bulkhead design updated the styling some and Incorporated the reinforced single body mount/ unmount feature. Then called it Emaxx/ Tmaxx 2.0. It seems Traxxas is just wanting to appease towards the younger crowd, but us older cats that have been doing this from the beginning should also be kept in mind. My Emaxx is built pretty close to bulletproof with the help of Monster RC, FLM and UE parts. The only Traxxas parts I use are the center chassis, transmission(upgraded bearings), motor mount, upgraded Traxxas CVD driveshafts/ axles, stock lower control arms and receiver. I run 6S all day long with punch control at highest setting with no failures. That's running on concrete(its worst enemy), grass and dirt. If I could still get UE parts, I would buy more of them, but I don't think the guy is making parts for it anymore. Monster RC and FLM is about as good as it gets for upgrades for the Emaxx/ Tmaxx. No cheap Integy parts here. That company makes their parts look the part, but they are far from an upgrade. Traxxas should bring back the Emaxx/ Tmaxx an upgraded form, but not with the Erevo suspension setup. I hate that type of front suspension setup. If it was such a revolutionary design, then even the best buggy and truggy chassis designs would have went to it. The only Traxxas vehicle I would buy would be the Xmaxx, but I don't feel like spending $1200+ for a RC truck out of the box. Last edited by ksb51rl; 02-06-2019 at 12:53 PM. The point is correct but, like I said, the reasoning isn't perfect for you. The T-MAXX kicked off monster trucks, the emaxx did not, that's why the tmaxx is still being made, it's a classic truck, the emaxx was a continuation, so it is not a classic, so it is not sold. And speaking of revo suspension, I would say that it is a revolutionary design (even though not created by traxxas) and you need to realize it can't fit into a truggy. If it could they'd be in there. They do have a truggy version with that same suspension. That would be the Erevo. There's more moving suspension parts. They wear out and fail or the suspension rod that goes down to the control arm bends or snaps off. It's not reliable. I said Emaxx...but, yes, I know the Tmaxx was the first. That's the first one I owned. It was fun to drive. I just don't do much nitro anymore. First off, e revo isn't a truggy. It's a monster truck. It's big, that's why it fits. If it was a truggy the suspension wouldn't fit. I actually have a complete different experience in my e revo compared to what you seem to have had, this suspension has been a fantastic thing for me. Not only do the shocks never wear out, because they're in board with no dirt ever touching them and completely out of harms way, all the other parts have been pretty durable. The only drawback is you must superglue all your rod ends in so they don't pull out. So far it hasn't broken unless I messed up horribly. My favorite feature is how when you take a hard crash to one wheel, instead of replacing an a arm or caster block like a conventional rc, you just bend a pushrod. Finish your run, take it inside, remove it from the vehicle, hammer it straight, and boom, good as new, no money gone. Also it allows you to have small shocks and have tons of travel. Want more travel? Replace the rocker arms for a different set, like their long travel suspension set, and it makes the articulation even more crazy. Once again, the e revo is not remotely even close at all to a truggy. Not even close! I run on 6s only and go to skate parks regularly. Last edited by Peeeenuuutt; 02-06-2019 at 05:13 PM. One of the things to consider is real basic: was there many E-MAXX Monster Trucks purchased over the years? Presently, there are numerous manufacturers that are building "8th" and "10th" scale electric monster trucks to replace the E-MAXX. It seems other manufacturers are doing well with their versions of this irreplaceable Traxxas R.C. E-MAXX Monster Truck. That information is based upon the emails I receive from hobby stores advertising what should be purchased for these times (to replace the E-MAXX). It's just my opinion; because I am enjoying my three E-MAXXs and they are not replaceable! Upgrades to them has been lots of fun. Also, there is a lot of info in both E-MAXX forums the has helped many people. Traxxas thank you for your next version of the E-MAXX, it will do very well. Last edited by maximum; 02-07-2019 at 03:09 AM. Sorry.... but that is no monster truck...truggy conversion at best. You can have that suspension...not my cup of tea. 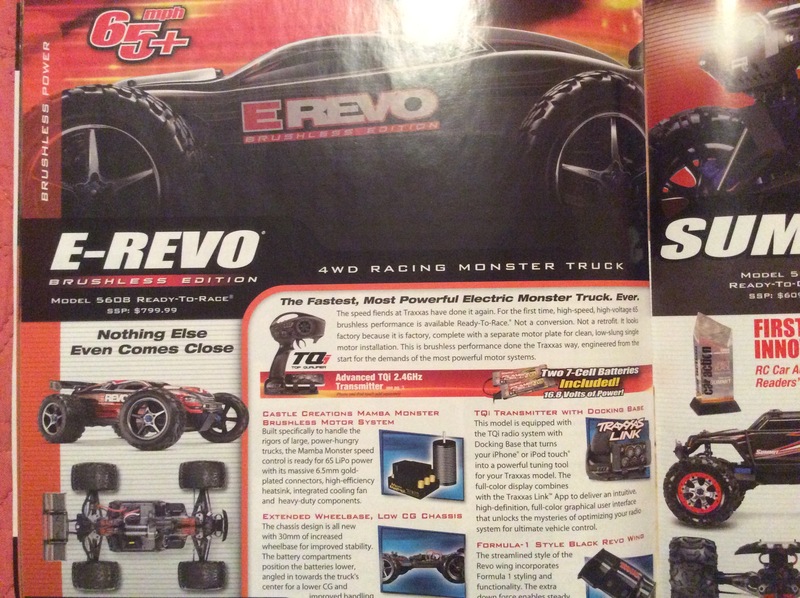 The Revo and E-Revo are monster trucks by the definition of monster trucks. Your dislike of them does not change reality, no matter how much you would like it to, so let's stop with that silliness right here. Now, now, lets not get to hasty. There are many interesting views here to explore as long as we maintain our civility, and use facts rather than emotional personal opinions. I did a little research, and found these secret historical documents in the Library of Congress (right next to a bunch of Area 51 stuff). 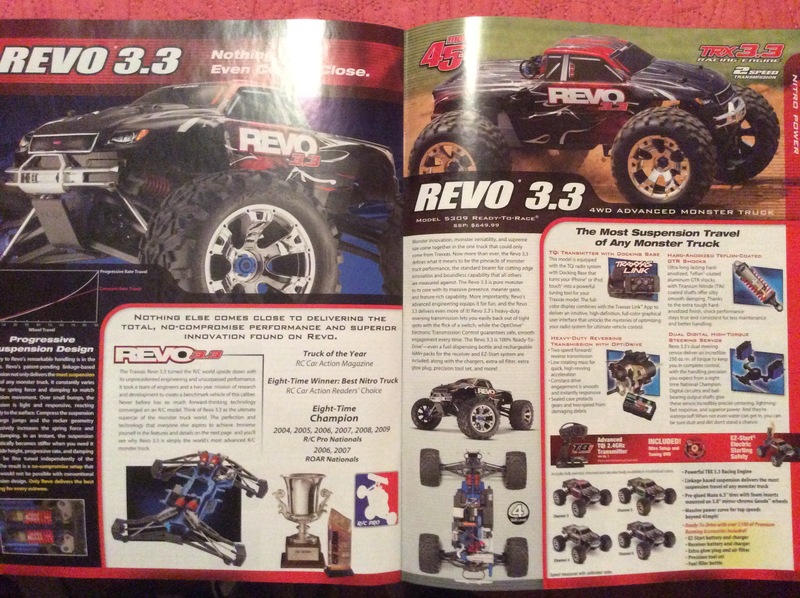 If you look at the first photo, right page, Traxxas advertises their 3.3 Revo as a monster truck. Notice the suspension, and you'll see that it's suspension height and suspension bar angle is comparable to that of a T-Maxx and Emaxx (Emaxx pictured above in my original post). 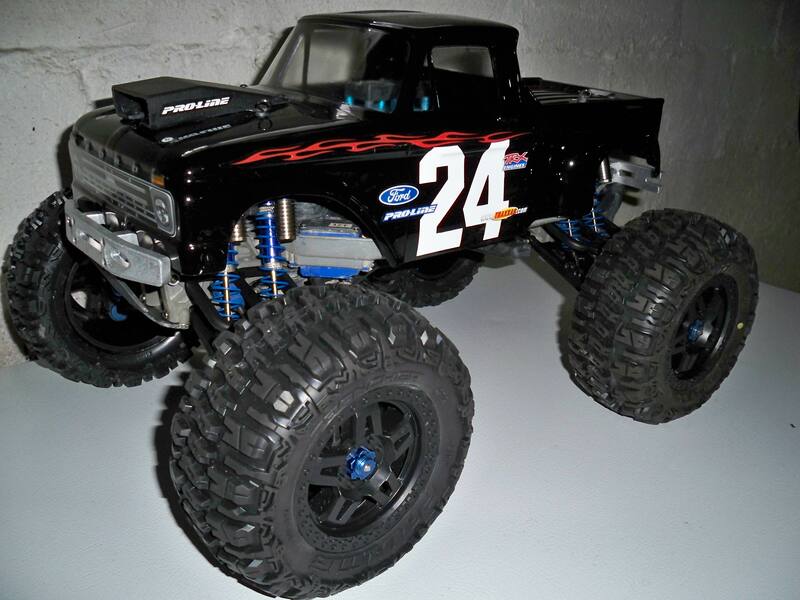 Now, look at the second photo of the Traxxas ERevo, and it too is referred to as a monster truck. However, look at the suspension height, and suspension arm angle. It's noticeably lower, and parallel to the ground in comparison to the above 3.3 Revo, the T-maxx and Emaxx. Next, I looked into, just what is the definition and difference between a buggy, a truggy, and a monster truck. From what information I could get a buggy is a light weight car-like RC used on smooth surfaces. A truggy is a car-like RC that is longer, wider than a buggy, and also has larger wheels than a buggy for use on rougher surfaces. A monster truck is a RC with the same large wheels, the same longer and wider chassis as a truggy, but with a higher suspension for use on even rougher roads that what a truggy is setup for. The T-MAXX kicked off monster trucks, the Emaxx did not, that's why the Emaxx is still being made, it's a classic truck, the Emaxx was a continuation, so it is not a classic, so it is not sold. Last edited by ReglarGuy; 02-10-2019 at 06:47 AM. There is no need to muddy the waters regarding radio control vehicle definitions. See page 67 and page 77 of the ROAR rules. All other rules are more rather than less irrelevant for our uses. I have no special knowledge, but I am not so quick to mark the E-Maxx as dead. Last edited by ksb51rl; 02-10-2019 at 12:15 PM. Maybe, just maybe, we’ll see an updated version of the emaxx. Larger shocks, better driveshafts, some other parts beefed up. We can dream at least!! I loved my emaxx and would really consider selling my Summit to get a new one if they do come out with one. I love my Summit, but my emaxx was my go to rc for just having a good bash. If the old Novak ESC wouldn’t have blown I would probably still be using it! No not really as the Xmaxx is a larger vehicle. Not that it’s not a sweet rig that I would love to have!! If there’s an emaxx 2.0 on the market I am instantly selling my e revo (well not before removing the esc) and buying that thing. The e revo vxl has become my favorite rc, but an emaxx 2.0 would be even cooler. I see what you're saying and I don't disagree with your research. We all have our own opinions. I still look at the Revo as a modified truggy or a hybrid that was crossed between a truggy and a monster truck. The ERevo is most definitely a truggy hands down. The monster trucks are still the Stampede, E-Maxx and X-Maxx in my opinion. Oh, about the buggy being used for flat surfaces....ummm...not exactly. I have a nitro 1/8 scale buggy that sees plenty of rough ground and jumps. I gots to agree with you 110% Peanut! If they come out with a 2.0 emaxx I would really be tempted to sell my beloved Summit for one!! Isn't the Erevo kind of the new Emaxx? I mean, both have large tires, and are designed for offroad/all-terrain use, but the Erevo has the better suspension and bulkheads everyone wants on the Emaxx. Of course the Erevo does sit lower, but I think it was meant to be a monster truck, that looks a bit like the Rustler, maybe a large 4x4 stadium truck? Either way, even with a few changes I think it would be able to replace the Emaxx to everyone that doesn't already have the soft spot in their heart for the Emaxx. Anyone who does, is probably not going for pure performance, rather they just like the memories they have with their Emaxx. There are two ways to find an answer to a question. One, is to already have an answer, and then try to prove it right; and two is, to clear your mind of everything, and let your research lead you to the answer of your question. Personally, in my heart, I agree with you a 99.9%. I personally think that the 3.3 Revo is a truggy with a monster truck body, the ERevo is a truggy, and that the 3.3 T-Maxx and the Emaxx are monster trucks. But, after looking into what the RC industry (above in my reply) defines as a buggy, truggy, and monster truck; I have to (at least for the time being) accept that the 3.3 Revo is a monster truck, the ERevo is a truggy, and that the the 3.3 T-Maxx and Emaxx are monster trucks. Above, KSB has introduced ROAR into the equation, and if I'm really interested in having my question answered properly (to be objective), I have to look into if ROAR (it may or may not) has any influence in the matter. Again, I have to go where the evidence leads me. When I get done I'll be sure to let you know what I find. Last edited by ReglarGuy; 02-12-2019 at 04:29 AM. Thanks for all your feedback over the months and years fellow RC'ers since I've been a member, and especially to you ReglarGuy for sharing your trials and tribulations with this incredible truck. As you may recall, I recently woke up my E-Maxx with some upgrades and it has been a blast. I just want to know why all of the people that are fortunate or lucky enough to have one or two or three of these trucks in their possession, aren't responding to such an iconic monster truck. Heck, I could see myself twenty years down the road still talking about this truck. I mean, when I'm sitting in a coffee shop with my cane and newspaper talking to someone in their 70's or 80's thirty-some years from now, we aren't going to be talking about the cars you use to drive with a tether behind them and you had to walk with them! We're going to be talking about the E-Maxx and X-Maxx and XO-1's. I really can't say much more, as the E-Maxx speaks for itself - I still draw a crowd with it and little kids are asking me where they can get one, and I'm thinking oh brother, how do I explain to them that they were born ten years too late. Next up, you will see RC's that have anti-collision technology and it will start braking before you pound that next mailbox post or tree or wall that you're going to run into. If they do that, I'm out of the hobby for good because it is bad enough TSM and TrueTrack made it easier to avoid obstacles - basically took the fun out of driving these things - well for the monster trucks anyway. I can understand TSM on something like the XO-1 because you're going 0 to 60 in 2.3 seconds or 100mph in 4.92 seconds. Other than that, TSM on my E-Maxx has only just saved it from possibly side-swiping a tree or two. Last edited by Flux Capacitor; 02-12-2019 at 10:50 PM. Reason: Just Saying! Welcome To The Futures' Past! The E Maxx was such a cool truck, everybody had one of two. Tough and indestructible. Many people I know learned how to drive with the emaxx. When it evolved to brushless it wasn't a weak monster anymore. Definitely disappointing it was dropped. But at least the T maxx lives. I really would like to have the e revo simply because it doesn't have the tall flip over stance of the maxx platform. Traxxas has their reasons when they discontinue a model but the emaxx will go down as a fan favorite. I mean, when I'm sitting in a coffee shop with my cane and newspaper talking to someone in their 70's or 80's thirty-some years from now, we aren't going to be talking about the cars you use to drive with a tether behind them and you had to walk with them! We're going to be talking about the E-Maxx and X-Maxx and XO-1's. Last edited by ReglarGuy; 02-13-2019 at 04:21 AM. Yeah, I hate TSM. I'm so used to correcting the RC myself, that when I try to use TSM, I end up overcorrecting, and it just makes it more difficult to drive, I think. It's definitely not as interesting as just hitting the throttle and watching the truck go it's own way, whether it's dirt, gravel, grass, pavement, or the brick wall of a school building you intend to backflip off of. (I do stupid things with my toys.) I don't think these aspects of RC trucks should be taken away. With TSM, it is a love/hate thing I can't fully integrate into monster truck driving. Like you, I am use to reading the trucks body language and articulation before committing to a command on the Tx. In other words, experience gained from all those years without it doesn't pay off when you enable TSM. However, the available amount of adjustment with the multi-function knob for TSM control, tends to ease the severity of the over-correcting nature that can ensue from drivers that were use to not having it. The only thing I haven't figured out with TSM is the drifting aspect. If I didn't have TrueTrack in the rear, I would probably be able to understand the concept better regardless of the fact that the truck isn't a drift car. When I upgraded my E-maxx with the TrueTrack, I installed the TSM Rx the same day; so I have no way of knowing if the TSM or TrueTrack is more responsible for one outcome or the other when drifting with the truck. Since I don't want to remove the TrueTrack, I'm not sure if the TSM alone is responsible for how the truck handles drifting. When I refer to drifting, I am relating to how the rear end slides on wet surfaces while your turning the wheels full chock opposite the way of the slide. Kind of like reverse steering. I would like to see Traxxas come out with a Monster truck that has the rear wheels being able to turn slightly like some very long vehicles do to compensate for their long turning radius. Of course this would mean more servos and intricate calculations that would need to be done to see if there would be a benefit to slight rear steering on RC's with such short wheelbases. I just think it would be interesting if the rear wheels counter-steered for better handling versus the TrueTrack design. I hardly ever use TSM, but I don't have a love/hate relationship with it. I would if I couldn't turn it on/off. The only time I really ever use it, though, is if I want to go in a straight line super fast, or when I play with a solid axle vehicle. I don't know why, but for some reason it's very handy on my solid axle Super Baja Ray. So, I have to believe that it would also be handy on a Traxxas UDR. I mentioned in another post that I got the new Traxxas catalog from one of my (LHS) the other day, and the Emaxx wasn't in there. It was a sad day, but do you all know what really made me sad? It was knowing that our future American youth will no longer know the goodness of the Emaxx experience. Much in the same way that our present day youth have never known the goodness and fun of playing with the original string and hardened glass Clackers and baseball size Super Balls. Remember those? Yes, you can still get them, but they're nothing like they use to be. They use to be so cool that you almost took your life in your hands just to learn how to play with them. Now, they're all either politically correct or sissy cry baby crap. Back then one of those Super Balls went a mile high. Now, they go about as high as a house. Also, when you slammed one of those base ball sized Super Balls onto the concrete, you better get your head out of the way while it was going up and back down, or it was a concussion for you young man. The same thing with the original Clackers. They were these two hardened glass balls connected by a string. You pinched the string in the middle of the two balls, and with a short quick repeated up/down motion these balls would keep bouncing off of each other. We'd get these things going so fast that they visually were a blur to watch. The faster they went, the cooler you were. Back then, you had to learn how to play with them fast, or suffer the consequences of having little small bruises all over you. What a great time that was to be a kid! Now, in todays world, all that is offered to kids are 1 inch diameter Super Balls, teeny-tiny little plastic Clack-its (I can't bring myself to call them Clackers), phones, Stampedes, and Rustlers. I don't want to beat up on Stampedes and Rustlers. They both have their place in the Traxxas lineup, but they're nothing compared to the Emaxx. Out of all of the products offered by Traxxas (now and over the years), the Emaxx was the only one that came RTR with crazy, over the top power and fun; much like the original Clackers and Super Ball. I can't help but to feel sad for the future of our American youth, because I know someday there dads are going to remember the unavailable greatness of the Emaxx as I do the original Clackers and Super Ball (wishing they could do more than share there memories). Please Traxxas, if you don't want to bring back the Emaxx for me, a ReglarGuy, then please do it for America. The future of her youth need you. P.S. In regards to whether the ERevo 2.0 is a monster truck or truggy; I looked into ROAR, IFMAR, NORRCA, IIC, and IOCC, and the waters are still kind of muddy (for me anyway). Some say it's a monster truck and others say it's a truggy. I seems it depends on if, when, and where you want to race or not. I personally have always saw the Xmaxx as the new E-Maxx. You had the 3906 (1.0), 3905 was more of a 1.5 and the Xmaxx was the 2.0. The E Maxx was such a cool truck, everybody had one of two. Tough and indestructible. Ill agree and disagree there. It WAS such a cool truck. The Emaxx wil always have special place in my heart. I'm 31 years old. The E-Maxx came out when I was around 13. I had some Tamiya's and a racing touring car at that age, but an E-Maxx was out of reach for a school kid. I then remember doing very well in a UK School exam (I think it was SATs?) and my Nan took me to her local shopping centre (she lived 200 miles from me) and said I could have anything in the model shop. I got an Emaxx 3906, it was all I wanted and it was the only choice to make. It wasn't the super early one, it had the Novak EVX as opposed to the VX12, but it ran awesomely on my matched nimh's from my Touring cars. I kept that Emaxx till 2007. By then I had upgraded every single part with the stupidly expensive Unlimited Engineering parts, with a Gorilla Chassis and a Lehner Brushless set up. I only sold that because Id passed my driving test and wanted a 1:1 car. The Emaxx is one of my favourite R/Cs of all time. since then Ive had a 3905, a 3908 and even another 3906 pre widetrack. HOWEVER. It was NOT a tough R/C, and was far from Indestructible. It was very very poor. The bulkheads were weak, the drivetrain was weak, the shock caps popped off. The A-Arms snapped, the slipper clutch burnt out, the pillow balls pulled out. That as just on 14 cell brushed! Id credit the Emaxx with starting the massive RC hop up program, but it was out of necessity not out of fun. Its an iconic, legend of RC. You will struggle to find a bigger fan of it than me. It changed RC. It took RC off the track and into the park. It arguably made Traxxas who they are today. But it should have been discontinued over a decade ago. It has no right being available in 2019 with a brushless system, its simply not good enough any more. And that's completely acceptable as its. 20 year old design. I'd definitely get rid of my ERBEv1 for a emaxx v2 if they did something nice with the shocks, diffs, bulkhead/hingepin setup. Heck, on 4S, erbev1 spec diffs hold up ok if your easy on the throttle. I would agree if it was 1/10th or even 1/8th scale. But it's not. It's a big bruiser of a vehicle. While I enjoy the snot out of my stampede 4x4, I'd quickly replace it with something a tad larger but designed similarly on 4S or 6S. That's where the e-maxx would come in. But it's shocks/hinge pin/bulkhead design is so dated that I never bothered with it.